Emancipation of women in fact completes with Sangkrit. Let us make a movement that finally eradicates all discrimination fully well including those made on gender basis. When everybody cleans own place, makes own meals, programs own world and blogs own mind without any difference for a man or woman or rich or poor, emancipation of women actually completes. This makes an all-inclusive execution that is called Sangkrit so that women are no longer held up within household chores anyhow more than men. Thus the loads for women get evenly distributed as for men. Number of women among the programmers are negligible despite the fact that the first programmer in history was a woman so Sangkrit has designed another befitting way for enhancing women’s role in humankind’s’ migration into internet age. Women across all the countries alike, should startup as personal outlet of the globally distributed order of Sangkrit. It is not only easiest for them but works indeed best in their interest. Not even any cultural contrast anywhere hinders them on this way. Women brought us on planet earth so we must make it possible for them to lead us into internet age as well. This could get accomplished by encouraging women everywhere to signup for the free SANGKRIT.net account to startup online. 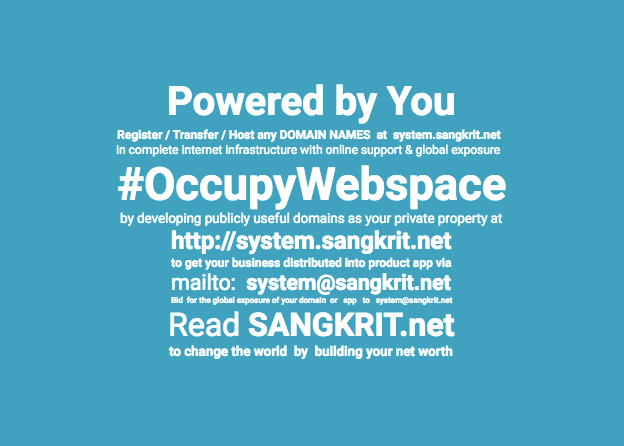 To startup as personal outlet of the globally distributed order of Sangkrit is open to every humankind but it is indeed a boon for every woman to startup online.